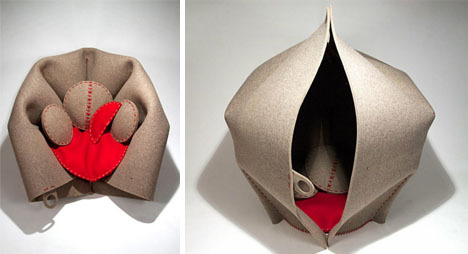 Ever feel like wrapping yourself in a warm woolen sweater and hiding from the world? 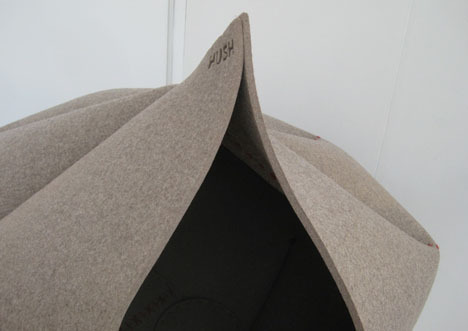 Now apply that idea to a crowded library, bustling airport, open-plan office or CCTV-filled civic structure and you have yourself the core concept of a Hush Pod. Designer Freyja Sweell notes that urbanization of populations is not stopping anytime soon, and nearly two dozen cities are already home to over ten million residents. Crowding comes with the territory too, so to speak, as real estate prices respond invariably to supply and demand. 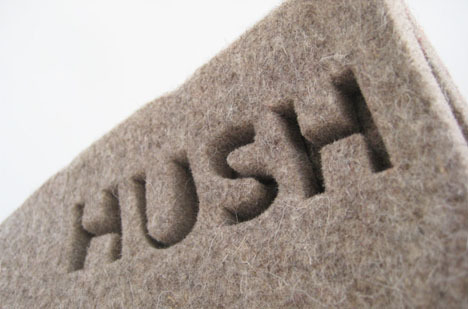 Created from a single-cut piece of 100% wool felt, sewn together with wool yarn, and filled with recycled wool fibers, these seats are made to be soft, dark and warm spaces in which to retreat from what is around you, if only for a few minutes. Wool is also flexible, breathable and durable, making it an excellent all-purpose material for something made to enclose a whole person on demand and subject to the wear and tear of non-domestic uses.